I received your letter of May 22, 2017 in which you refer my attention to the article that Mr. Emmett O’Regan posted on the internet in relation to Rev. Fr. Joseph Iannuzzi. On May 3, 2017 the Archiepiscopal Curia and I welcomed Rev. Fr. Joseph Iannuzzi who explained to me the specifics contained within Emmet’s letter. In this regard, I desire to indicate that that which I am to share with you about the Servant of God Luisa Piccarreta is all contained already in the Communcation n.3 which I hereby attach. Therefore Rev. Fr. Joseph Iannuzzi’s work of research and diffusion undertaken in relation to the Servant of God Luisa Piccarreta is properly understood in light of this declaration [Communication] of mine to which, to this day, I have made no additions, as there have not been any new developments to the Cause of Beatification and Canonization that are underway at the Holy See. Moreover since Fr. Joseph is not canonically affiliated with this archdiocese, I am convinced that his good reputation, which I have never called into question, will be best reaffirmed by his legitimate Superior. I assure you of my prayers in your esteemed work, and I extend to you my warm greetings. Given the fact this matter involves the breach of an ecclesiastical moratorium and the lack of imprimatur, imprimi potest and nihil obstat in the books of a member of a religious institute, it pertains solely to obedience, and as such, should be settled by Fr. Iannuzzi's legitimate religious Superior, not in a civil court of law. This is why Archbishop Pichierri stated that it is up to Fr. Iannuzzi's legitimate Superior to reaffirm his good reputation, and not him. Since Fr. Iannuzzi is incardinated in a different diocese (as to where seems to be kept secret), Archbishop Pichierri did not have canonical jurisdiction over him, and as such could not resolve the dispute himself. The number of ellipses in the above fragment of Fr. Iannuzzi's attorney's letter to Archbishop Pichierri is worth noting, as we don't get the full picture of what was being demanded here. Dear Mr. Emmett O'Regan, I received your e-mail of 21 February 2017 which informed me of your study and the response made on the publications of the priest Joseph Iannuzzi. Point out that this priest does not belong to this Archdiocese and did not receive from me any authorization, permission or warrant of any kind and in relation to publications both in reference to their study and diffusion. Right now the Archdiocese and the Association "Luisa Piccarreta - PFDV" are engaged in the typical edition processing and critical writings of the Servant of God on the basis of which it will be possible to complete the necessary translations in other languages ​​and additional theological research to be conducted. In any event, all of the official study activities at this time are agreed and coordinated in harmony with the Congregation for the Causes of Saints through the postulation. I assure you full availability for any further clarification, I greet you cordially and a Happy Easter. You can find the official text of the letter here. While we can't establish all the ins and outs, it appears that he was making some form of legal demand that Archbishop Pichierri restore his "good name" by confirming that he did not breach the moratorium. Instead, the Archbishop directed his attorney to communication n. 3, and said that Fr. Iannuzzi's diffusion of Luisa's writings corresponded to the contents found there. “As I have already expressed at the conclusion of the diocesan phase of the Cause, it is my desire, after having heard the opinion of the Congregation for the Causes of Saints, to present a typical and critical edition of the writings in order to provide the faithful with a trustworthy text of the writings of Luisa Piccarreta. So I repeat, the said writings are exclusively the property of the Archdiocese” (Letter to Bishops of October 14, 2006). To accomplish this demanding work that requires a certain kind of competence, I shall avail myself of a team of experts chosen in agreement with the Postulation. Nevertheless, I must mention the growing and unchecked flood of transcriptions, translations and publications both through print and the internet. At any rate, “seeing the delicacy of the current phase of the proceedings, any and every publication of the writings is absolutely forbidden at this time. Anyone who acts against this is disobedient and greatly harms the cause of the Servant of God.” (Communication of May 30, 2008). All effort must be invested in avoiding all “leaks” of publications of any kind. This stands in immediate contrast with Fr. Iannuzzi's claims to have a direct mandate from Archbishop Pichierri to speak, study and write about about the life and writings of Luisa Piccarreta. However, Fr. Iannuzzi is twisting the meaning of this letter to mean that the Archbishop had "cleared the air", and that he had actually endorsed his diffusion of her writing. I think this is an outlandish claim, which if true, would make the Archbishop completely contradict himself when he had confirmed to me just a few months previously that Fr. Iannuzzi's diffusion of Luisa's works were not authorized by him in any way. (1) Archbishop Pichierri told me that Fr. Iannuzzi "did not receive from me any authorization, permission or warrant of any kind and in relation to publications both in reference to their study and diffusion". (2) He stated in his letter to the attorney that Fr. Iannuzzi's diffusion of Luisa Piccarreta's works corresponds to that in communication n. 3, issued in 2012. (3) Communication n. 3 explicitly states "the said writings are exclusively the property of the Archdiocese..." and that "any and every publication of the writings is absolutely forbidden at this time. Anyone who acts against this is disobedient and greatly harms the cause of the Servant of God.” (Communication of May 30, 2008). All effort must be invested in avoiding all “leaks” of publications of any kind." When I had asked Archbishop Pichierri about the status of two books which contained the writings of Servant of God Luisa Piccarreta, which were published after the moratorium was set in place, he confirmed that Fr. Iannuzzi did not have permission of any kind to publish the writings of Luisa. Fr. Iannuzzi had published an abridged collection of Luisa's writings in 2013 after obtaining his doctoral thesis. But given the fact that the Archbishop had placed a moratorium on "any and every" publication of Luisa's writings until the publication of a future critical edition, Fr. Iannuzzi would have required the Archbishop's permission before doing so. Given that Fr. Iannuzzi did not have this permission, I could only be left to conclude that he had violated the moratorium in issuing this abridged version of the collected works of Luisa Piccarreta. However, Fr. Iannuzzi is insisting that he has not breached the moratorium, since he was granted the authority to publish these writings by the Gregorian Pontifical University, and thus did not require any permission from the Archdiocese of Trani. I would very much like this claim to be validated by Fr. Iannuzzi's religious Superior or responsible ordinary. If his ordinary or Superior can establish that it is true that some form of loophole has been exploited to allow Fr. Iannuzzi to publish these writings without either permission from the Archdiocese of Trani, imprimatur, imprimi potest or nihil obstat, despite a moratorium remaining in place, I will happily retract my claim, and offer Fr. Iannuzzi a full and complete apology. But I don't think this is the case, and will present the reasons why this is so below. First, the print edition of Fr. Iannuzzi's doctoral thesis containing an abridged version of the writings of Luisa Piccarreta disappeared from availability on Amazon around the exact same time as Archbishop Pichierri received the letter from Fr. Iannuzzi's attorney on 22nd May, 2017. As of the time of writing, it is still unavailable (see here). Although the fact that it is still available on Kindle suggests that Fr. Iannuzzi has either exploited some loophole pertaining to electronic editions, which isn't covered in the moratorium, or simply hasn't fully complied with whatever instruction was given to him to take the print edition out of circulation, which would have been given by either the Archbishop or his Superior. It is quite unlikely that either Fr. Iannuzzi or his publisher St. Andrew's Productions would suddenly have decided to pull one of their most popular works from availability on Amazon for no apparent reason, which just so happened to coincide with the timing of the letter issued by Fr. Iannuzzi's attorney landing on the Archbishop's desk. Perhaps his publisher can help to clarify this matter further. "Members of religious institutes also need permission of their major superior according to the norm of the constitutions in order to publish writings dealing with questions of religion or morals." §3. Along with the local Ordinary, religious superiors have the responsibility of granting permission for the publication of writings dealing with questions of religion or morals by members of their institutes (cf. can. 824 e 832). §4. All superiors, especially those who are Ordinaries (cf. can. 134, §1), are obliged to take care that within their institutes ecclesiastical discipline is followed also as regards the instruments of social communication. If abuses emerge, they are to insist upon its application. §5. Religious superiors, especially those whose institutes are dedicated precisely to the apostolate of the press and the social communications media, should see to it that their members faithfully follow the pertinent norms of canon law. They should give special attention to publishing houses, book stores, etc. associated with the institute, to encourage their being faithful and effective vehicles for the Church and her magisterium. §6. Religious superiors should cooperate with diocesan Bishops (cf. can. 678, §3); it may be that such cooperation is even formalized through written agreements (cf. can. 681, par§1-2). §1. The religious superior, who in accordance with can. 832 is competent to grant his own religious members permission to publish writings dealing with questions of religion or morals, should not proceed to do so until he has the prior judgement of at least one censor he considers reliable and is satisfied that the work does not contain anything which might be harmful to the doctrine of the faith or morals. Once the nihil obstat is obtained from the appointed censor, the religious superior is then free to grant the imprimi potest if he deems it prudent to do so, and the imprimi potest is then stipulated in the front matter of the book alongside the nihil obstat and the name of the censor who granted it. After this, the imprimatur is then granted from the local ordinary of either the location of the author's residence, or the location in which the book is to be published, so that the lay faithful can be assured that the book is quite likely to be free of any potential harm to faith or morals. Of course, these measures don't always guarantee that any given book with imprimatur is absolutely free of any doctrinal errors, it is a measure which makes it all the more unlikely, and gives the faithful some peace of mind that they aren't likely to be led astray by the given contents. So for Fr. Iannuzzi's works not to have nihil obstat, imprimi potest, or imprimatur to be stipulated on his various books is quite anomalous indeed, and needs to be explained by his religious Superior, who should have issued imprimi potest before publication, and should have been in contact with the local ordinary issuing imprimatur, as stipulated in par. 16:§6 of the above instruction from the CDF. Indeed, the requirement of imprimi potest can even come above that of imprimatur for members of religious institutes (see par. 17 §2 of the above CDF instruction). As to why Fr. Iannuzzi's various books lack nihil obstat, imprimi potest and imprimatur, it is quite evident that either they haven't been granted because of the presence of serious doctrinal errors, or they were not even sought because the author knew that they would not be granted for precisely the same reason. Given his clerical and academic status, vow of obedience, Canon Law and the above CDF instruction, these writings should never have been published without the express permission of his religious Superior. Stephen Walford provides an excellent summary of Fr. 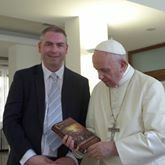 Iannuzzi's various theological errors in the epilogue of his book Communion of Saints: The Unity of Divine Love in the Mystical Body of Christ, which he was able to present to Pope Francis in person, during his 45 minute private audience with the Holy Father at the Santa Marta residence on 27th July, 2017 (see below). As recently as May this year, Fr. Iannuzzi was arguing that Vassula Ryden’s messages are “Church approved”, because her book contains the “imprimatur” of Archbishop Arguelles of Lipa and the "nihil obstat" of Bishop Felix Toppo - two of her known supporters. Fr. Iannuzzi argues and that this was an “act of the magisterium” and thus requires the same level of “religious assent” that we are obliged to give to the ordinary papal Magisterium (see here). This outrageous claim helps us to perceive the extent to which Fr. Iannuzzi is capable of twisting the facts to suit his own dangerous agendas. §1. According to the norm of can. 824, the competent authority for granting approval or permission is either the proper local Ordinary of the author or the Ordinary of the place in which the work is to be published. §2. If permission is denied by one local Ordinary, recourse may be had to the other competent Ordinary. There is the obligation, nonetheless, to make the fact of the prior refusal of permission known. The second Ordinary is not to grant permission without having learned from the first Ordinary his reasons for denying it (cf. can. 65, §1)." As such, there are only two viable options for an author to gain imprimatur, which has to be granted within the proper canonical jurisdictions, with the appointment of an impartial censor being made by the competent authority. So the Archbishop of Lipa definitely wasn’t the competent ecclesiastical authority for granting imprimatur to Vassula Ryden’s book. Moreover, a naturally predisposed censor cannot be deliberately chosen by someone outside of the competent authority, since this method obviously undermines the goal of the entire process. Also, the magisterium of a bishop isn’t the same as the papal magisterium, so doesn’t require the universal submission of the will and intellect. 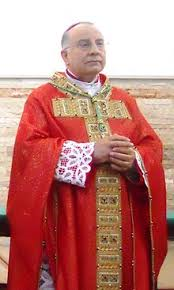 I believe Archbishop Arguelles was deliberately targeted for granting “imprimatur” by Vassula Ryden's circle of advisors because he was already a known vocal supporter, and did not fully understand that he was not the competent authority to grant imprimatur to her writings. Indeed, Archbishop Arguelles’ approval of the previously condemned apparitions of “Our Lady, Mary Mediatrix of all Grace” at Lipa in 2015 was declared “null and void” by the CDF in December 2015, since it had already been decided the papal authority of Pope Pius XII. The Archbishop was then forced to resign in February this year as a direct result (see here). So he undoubtedly suffered from poor judgement in matters related to private revelations. This “imprimatur” sought by Ryden in 2005 seems to be a concerted effort to undermine the CDF notification on her writings issued in 1995, which also condemns the same type of millenarianism proposed by Fr. Iannuzzi concerning the “era of peace”. Targeting bishops already predisposed towards favouring her writings for granting “imprimatur” and "nihil obstat", instead of being appointed an impartial censor from the competent authority, is a deliberate "stacking the deck" tactic designed to rehabilitate a series of writings which were already condemned for their millenarian-style doctrinal errors. Fr. Iannuzzi was promoting Vassula Ryden as recently as September 2017, during a conference in Melbourne, Australia, where he once again argued that her writings are “Church approved” because they bore invalidly obtained "imprimatur" and "nihil obstat" (see here). Given the fact that I run a blog on Catholic eschatology and take the time to try to respond to the comments on it, I can see that Fr. Iannuzzi's ideas have filtered out very widely into American society and beyond. Fr. Iannuzzi's millenarian eschatology is central to false prophets such as Maria Divine Mercy, and his ideas on a future "spiritual millennium" was widely disseminated through Dr. Kelly Bowring's various books, which are Catholic bestsellers in America. He has a large number of followers who are absolutely dedicated to him, given his priestly and academic status, and is in effect the de facto leader of a millenarian cult. He provides the “Divine Will Movement” (a separate entity from the official Association of Luisa Piccarreta PFDV) with its primary intellectual foundations in his books. In a nutshell, Fr. Iannuzzi attempts to argue for a ressourcement to the Chiliasm of the Early Church, only instead of a physical Coming of Christ, he states that there will be an invisible “intermediate” Coming of Christ in the Spirit, who will the slay the Antichrist and bind Satan for a “thousand years”, which he equates with the period of peace promised by Our Lady of Fatima. According to Fr. Iannuzzi, we must reject the amilliennial eschatology of St. Augustine of Hippo, which has been accepted as the established model by the Catholic Church for the past 1,600 years, and as such, is part of the universal sensus fidelium. Luisa Piccarreta is so important to Fr. Iannuzzi because she provides the key to how there will be a complete cessation of evil on earth, since everybody in the world will live according to the “Divine Will” for the duration of the Millennium of Rev 20. He suggests that there will be a total transformation of society, basically a return to Eden on earth, which is in direct contrast to clear Magisterial teaching that evil must remain in the world until the Second Coming of Christ (e.g. Guadium et spes 37; CCC 671). Obviously human freewill is a major obstacle to the theory that there could be total universal peace on earth for a thousand years, so Fr. Iannuzzi tries to explain this by asserting that everyone in the world will be granted the gift of "living in the Divine Will" (which the way Fr. Iannuzzi puts it, is really just the heresies of quietism or monothelitism). Fr. Iannuzzi attempts to confine the meaning of the word millenarianism to apply only to ancient Chiliasm, and ignores the fact that CCC 676 clearly uses the word in the broader academic sense as defined by Norman Cohn in his vastly influential work The Pursuit of the Millennium (given the fact that the secular forms of millenarianism in systems such as Marxism and Nazism are singled out for particular condemnation). So he thinks that if he posits a “spiritual” middle Coming of Christ, instead of a physical return to rule with the resurrected saints in an earthly millennial paradise, then he can evade the charge of millenarianism. In his book Antichrist and the End Times, Fr. Iannuzzi follows Joachim de Fiore in asserting that another “Gog” Antichrist will arise at the end of the “age of the Spirit”, when Satan is unbound again, and the forces of Satan surrounds the camp of the saints. It is only after this we have the physical coming of Our Lord, which according to Fr. Iannuzzi's schema is really a "Third Coming", instead of just one Second Coming at the end of time. This contradicts St. Robert Bellarmine, who forcefully argues for just one Antichrist, who appears at the very end of the world, after the bringing in of the fullness of the Gentiles (de Controversiis Book 3:IX). Fr. Iannuzzi’s ideas have proven popular among Catholics in America in particular, given the pervasiveness of premillennialism in wider society. I suspect that the moratorium was placed on Luisa Piccarreta’s writings precisely because of the way he and others were distorting her words to give a millenarian sense. Archbishop Pichierri was convinced Luisa's writings can be interpreted in a manner consistent with Church doctrine and the Magisterium, which is why their publication was suspended until a future critical edition can be issued by the Archdiocese of Trani. Fr. Iannuzzi was too impatient for this, and thought that he could issue an abridged version of the entirety of her works through publishing his doctoral thesis, in order to support his wider millenarian theories presented in his other books. According to the Divine Will Movement, the writings of Luisa Piccarreta are viewed as essential for obtaining the gift of Living in the Divine Will, which is why Fr. Iannuzzi appears to have been so impatient, and decided to publish them himself in an abridged form. This appears to have been taken to provide a rallying-point to his followers, so they might adhere to them as if they are some form of gnostic text essential for attaining salvation. He also probably knows full well that his interpretation of her writings will be totally ruled out in the future critical edition of her writings, since it is almost inconceivable that he hasn't been corrected on his bizarre millennialist eschatology by anyone with any authority in the Church. Archbishop Pichierri was absolutely convinced that the writings of Luisa Piccarreta are free of any doctrinal errors, but ruled that there should be a complete suspension of the publication of her writings in order to allow for a future critical edition, which will offer detailed theological commentary on how her material can be interpreted in a way that is consistent with Church doctrine and the Magisterium. Some highly esteemed American theologians such as Fr. John Hardon and Fr. William Most, had argued that the concept of "living in the Divine Will" as postulated by Luisa herself was just basically one and the same as the heresy of quietism. But since the Archbishop was convinced that such notions were being imputed into Luisa's writings by others, and were not actually found in the texts themselves, we should trust him in his word, and patiently await the future critical edition to see how her writings do actually align with the perennial teachings of the Church. It is quite probable that the previous writings of Luisa have been poorly translated into English to give her words a sense that isn't found in the original local Italian dialect they were written. As someone who can translate the Bible from its original Hebrew, Greek and Aramaic, I can fully appreciate that some translators can easily impute an interpretation of their own into any given text, if they are employing eisegesis instead of exegesis. In any case, the postulators of Luisa Piccarreta have been instructed to leave her writings to the side for determining her Cause, as they cannot be used to call her personal sanctity into question (much as is the case with Blessed Anne Catherine Emmerich). In his various books, Fr. Iannuzzi uses the concept of "living in the Divine Will" to explain how humanity will be able to live in perfect peace and harmony during a future "era of peace" which he equates with the Millennium of Rev 20, in a theory which is basically a thinly-veiled version of the eschatology of the Calabrian Abbot Joachim de Fiore, whose works were condemned as heretical by several popes. So it is quite likely that Fr. Iannuzzi's various books, such as The Splendor of Creation, do not bear imprimatur, imprimi potest or nihil obstat precisely because of these various theological errors. For a priest of his standing and academic training not to have imprimatur, imprimi potest or nihil obstat on these books, which are in themselves highly controversial and creating huge division among Catholics, is a quite serious matter, and prompts us to ask why this has been allowed to occur unchecked by the Church hierarchy? This matter urgently needs to be addressed not only by Fr. Iannuzzi's religious Superior, but also by the bishops of the various dioceses in which his ideas are being widely disseminated into American society and beyond. La Stampa has published my response to the criticisms of my previous article on the legitimacy of the Filial Correction on Vatican Insider (see here). This article was composed chiefly in response to claims by Christopher Ferrara on The Remnant, and Fr. Brian Harrison and others on Life Site News that I was positing an "infallible" ordinary papal Magisterium, which is simply untrue.